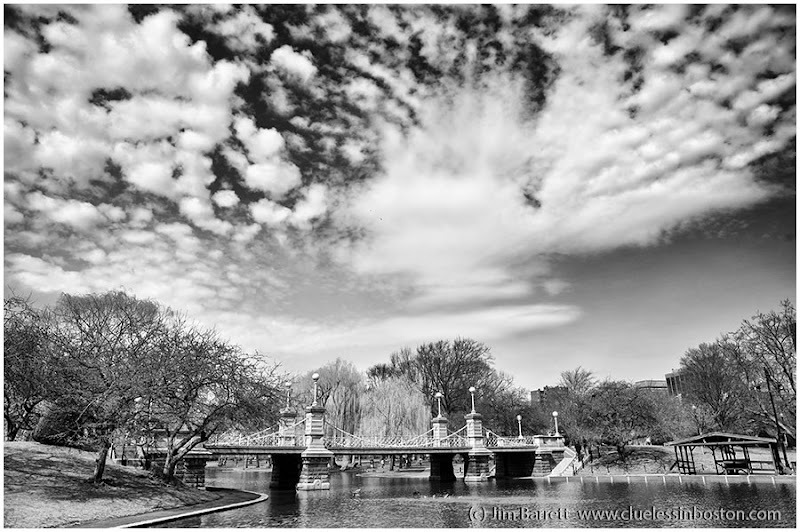 Suspension bridge in the Boston Public Garden. Beautiful bridge and amazing sky. You get an A+ for this one. Everything in this picture seems to be arms up,like to celebrate sping's arrival, to breath , to show joy! Glorious! What a fabulous shot! Really works in black and white. Cool capture! Happy sky watching. Nice one. This would have been a very cool time-lapse movie. Sometimes skies look even more amazing in black and white than in colour. I have been a long time follower of yours. This is the BEST work I have seen yet. My goodness this is beautiful work. Going to visit Boston soon. Wow, what a great photo! I love the lighting and the huge sky. It looks like you have a long, fantastic summer ahead of you! Who do you think you are, Ansel Adams! Fantastic shot!